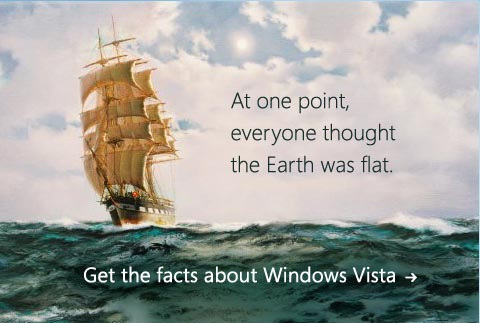 Microsoft looks to be rolling out its “Vista isn’t so bad, see?” ad campaign, as this delightful little jpeg shows. You know how people used to think the world was flat, but then a bunch of explorers proved them wrong? Apparently Microsoft will try to demonstrate that Vista actually doesn’t stink on ice. Good luck with that. Somewhat less snarky, ZDNet talks about the same ad, and explains why Microsoft has its work cut out for it self, even if Vista is now much better. (I haven’t used Vista since last summer. This MacBook uses Windows XP when it goes into BootCamp to play Team Fortress 2, which is the best PC shooter I’ve ever played. Granted, I’ve played like three my whole life, but the point stands.) Those “Get a Mac” ads Apple ran completely skewered Microsoft, and largely are responsible for the public’s “Vista is lame” perception. If Microsoft were to release a point-by-point refutation, that’d be seen as legitimizing Apple’s claims. Can’t have that, now can we? Microsoft is said to have spent a cool $300 million on this ad campaign, so it’ll be fascinating to see what the Admen have come up with. We regularly throw around award-winning ideas in our chat room, and we’d cost much less than $300 million.